2. Ductus arteriosus: a connection between the pulmonary artery and the aorta. 3. 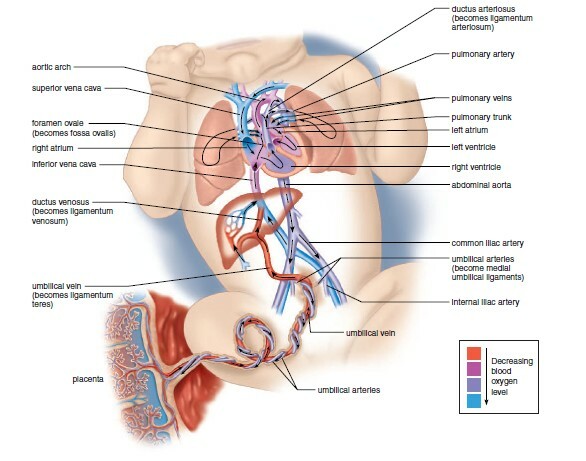 Umbilical arteries and vein: vessels that travel to and from the placenta, leaving waste and receiving nutrients. 4. Ductus venosus: a connection between the umbilical vein and the inferior vena cava. All of these features can be related to the fact that the fetus does not use its lungs for gas exchange, since it receives oxygen and nutrients from the mother’s blood at the placenta. During development, the lungs receive only enough blood to supply their developmental need for oxygen and nutrients. Most of the blood that enters the right atrium passes directly into the left atrium through the foramen ovale because the blood pressure in the right atrium is somewhat greater than that in the left atrium. The rest of the fetal blood entering the right atrium passes into the right ventricle and out through the pulmonary trunk. However, because of the ductus arteriosus, most pulmonary trunk blood passes directly into the aortic arch. Notice that, whatever route blood takes, most of it reaches the aortic arch instead of the pulmonary circuit vessels. Blood within the aorta travels to the various branches, including the iliac arteries, which connect to the umbilical arteries leading to the placenta. Exchange between maternal and fetal blood takes place at the placenta. Blood in the umbilical arteries is oxygen-poor, but blood in the umbilical vein, which travels from the placenta, is oxygen-rich. The umbilical vein enters the ductus venosus, which passes directly through the liver. The ductus venosus then joins with the inferior venacava, a vessel that contains oxygen-poor blood. The vena cava returns this mixture to the right atrium. Changes at Birth Sectioning and tying the umbilical cord permanently separates the newborn from the placenta. The first breath inflates the lungs and oxygen enters the blood at the lungs instead of the placenta. Oxygen-rich blood returning from the lungs to the left side of the heart usually causes a flap on the left side of the interatrial septum to close the foramen ovale. What remains is a depression called the fossa ovalis. The fetal blood vessels and shunts constrict and become fibrous connective tissue called ligamentums in all cases except the distal portions of the umbilical arteries, which become the medial umbilical ligaments. Thanks so much for this video! I am a highschool student and this helped me greatly to prepare for my test tomorrow. I didn't quite understand before, but now everything is clear. How to Remember the branches of External Carotid Artery (ECA)? Founded in 2011, MedchromeTube allows people to discover and watch medical and health videos from YouTube. MedchromeTube provides a simple platform for medical students, doctors and others related to the medical profession across the globe that makes learning process of medical science more fun and interactive. What is best for learning?